Last night, you changed my life. I don't even know you, and yet, you spoke a thousand things to me in a single picture. I regret to tell you, that I've never heard your music. I had, honestly, never heard of you before last week. I guess I wasn't paying attention. I hope that doesn't offend you. So my intentions in writing you this letter, before you see our Savior, are as pure as gold. I am not seeking to bask in the shadow of your celebrity. I'm writing you because I, like millions of others, saw the photo of you cuddling your toddler baby in an article last night. I just took the whole beautiful tragedy in over the course of several minutes. I wept a little thinking of how you are doing exactly what we should all be doing as mothers: seizing the time we have left. Because, really, we all know deep down that these lives are just as changing and fragile as the leaves. I've lived this year fearful, anxious, panicked, and depressed. I've had some minor health issues, but nothing like what you are currently enduring. And yet, I've lived as though there was no hope. I'm embarrassed by that. You reminded me that while you are very fragile and filled with excruciating pain, that I am not, and I've chosen not to live life like I should. You reminded me that the present moments we have are all that we truly have, and that gift of "next breath" may never be breathed. You showed me that I should be thankful to still be able to make meals, chase my toddler, and carry the endless loads of laundry because I am able to do so. I'm sure I would miss that if it was taken from me. I can only imagine you would love to do that for your family right now. And I bet you would make them the most delicious feast, and the smile wouldn't leave your face. I can't remember the last time I smiled while making dinner. I bet you wouldn't grumble about folding tiny pink clothes before your sweet Indy throws them all across the room. The laundry game that almost every mother can relate to. I know you wouldn't turn down "just one more book" or that glass of water before bedtime because there can never be too much reading and serving, really. You've reminded me that the "just make it until bedtime" mentality is an outlook that doesn't welcome the mess-making and joy-filled chaos. And so, you've ruined me. And I'm glad you have. I needed the ruining; the realization that these family times are the best of times. Joey, I don't know exactly what you're feeling at this moment, but know this: you are still doing the hard work of motherhood. You're teaching all of us that motherhood is beautiful in all stages, even when it's time for motherhood to end. I will be praying for you and your family in the coming days, weeks, months, years. I hope your daughters can always somehow experience the love you have for them, even from afar. And I will always remember that you taught me more from a picture than any book, blog post, or mom friend could ever gift me. 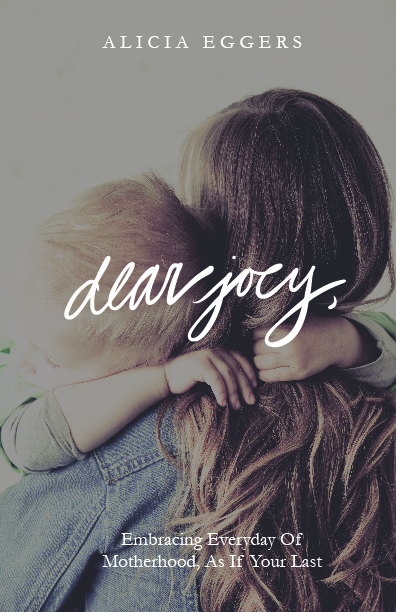 To love each messy, crazy, motherhood moment and to LIVE fully in each breath. ******The tentative release date for "Dear Joey," is this weekend, January 29th, 2017! Stay tuned for the release announcement!